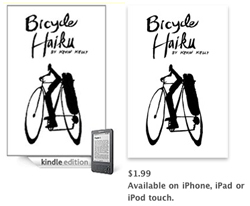 As Kevin already mentioned, his book Bicycle Haiku recently became available for the Kindle. And now, I’m happy to report that it’s also available in the iBookstore. In both cases, we prepared the e-books in-house and uploaded them for distribution through self-publishing programs (Amazon’s Kindle Direct Publishing, and Apple’s iTunes Connect, respectively). Although there were some differences in the file preparation processes, the most significant distinction between the services so far is the application process and the length of the wait from when you submit your file to when it actually shows up for sale in the store. With Kindle Direct Publishing (KDP), account creation is instantaneous. You need to provide tax and payment information, but that’s about it. With iTunes Connect, in addition to tax and payment info, you also need to apply with at least one ISBN for a title you intend to distribute. They also specify that you must be able to deliver valid EPUBs. Optionally, you may submit your prepared EPUB with your application, and I did so. It was about two weeks before we were notified of our acceptance into the program. In terms of delivery time, the file we submitted to KDP was available within a day. With iBooks, it was fully 15 business days (5 business days longer than Apple says it might take) before our book appeared in the iBookstore. The upload mechanics are also slightly different from one service to the next (KPD’s upload is done in-browser, iTunes Connect makes use of a separate uploader program which you install locally), but the distinction is trivial next to the huge disparity in wait time. Besides the inconvenience of the wait, this delay on Apple’s side means that while we’ve already accumulated several weeks of sales data from Amazon, we’re still in the early days of our iBooks sales, making a side-by-side performance comparison difficult. If you want to release titles on both platforms in parallel, it would seem you should initiate with Apple and confirm the release there and then release to Amazon — this would at least minimize the gap in release time.